The IDPS programme commissions the team at the Population, Policy and Practice Programme at the University College London (UCL) Institute of Child Health to collect screening outcome data on HIV, syphilis and hepatitis B. Together we are reviewing the data collection processes and systems, and planning updates and modernisation for the future. Helen Peters, the study co-ordinator and statistician for the national study of HIV in pregnancy and childhood (NSHPC) updates us here on some exciting changes. "Running a national surveillance study is hard work, both for those submitting data in clinics and for those processing and analysing data in the office. Over the last few months, the team at NSHPC has made some important changes that will make reporting more efficient and straightforward at both ends. 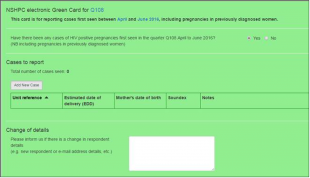 "The quarterly ‘green cards’ used for the obstetric reporting scheme have moved online after a successful pilot with 100 respondents. Most participants in the pilot gave very positive feedback and found the system easy to use, less time-consuming, and more secure and eco-friendly, than using the post. "The online reporting allows respondents to catch up easily with reporting backlogs and is a secure and reliable way to keep track of reporting history and outstanding reports. "To help respondents transition towards online reporting, the NSHPC has given its website a brand new look, complete with resources for respondents such as reporting forms, frequently asked questions, and online tutorials for completing the online green cards. Find out more in our recently published newsletter. "Last but not least, the NSHPC is now on Twitter. 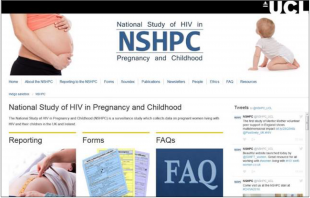 Follow @NSHPC_UCL for updates on recent publications, trends, and other news about HIV in pregnancy and childhood." Visit https://www.ucl.ac.uk/nshpc or email nshpc@ucl.ac.uk for more information about the NSHPC. The team will also have a stand at the upcoming IDPS regional workshops so come and say hello.